Twenty-five years ago audiences were introduced to the small desert town of Perfection, Nevada and the strange problem they were facing. Actually it was four very big problems. Four huge underground worms were burrowing their way all around the place and grabbing and munching through as many of the local residents as they could get their tentacles on. A pair of two lowly handymen, a seismologist, an extreme survivalist couple and the rest of the handful of locals had to man up, work together, manage to keep their feet on higher ground and figure out a way to kill these pesky ‘graboids’. This ladies and gentlemen was Tremors. Since its debut, this goofy, funny, self-aware B-monster movie has spawned a short-lived television series and three direct-to-video movie sequels, with a fourth being filmed at the moment. I have always loved Tremors since first seeing it. I thought it was really fun, knew exactly what it was aiming to be and succeeded in spades. It had a sense of humor about itself and its monster movie convention roots. 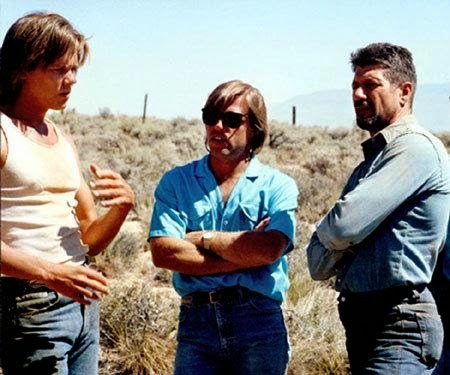 It wasn’t the most expensive movie ever, but it was creative enough to tell its story with some very unique scenes, allow its cast to play off each other in entertaining ways and never let them get completely upstaged by those graboids. Twenty-five years later I still think the movie holds up and is as fun as ever. The premise is like ‘Jaws on Land’. 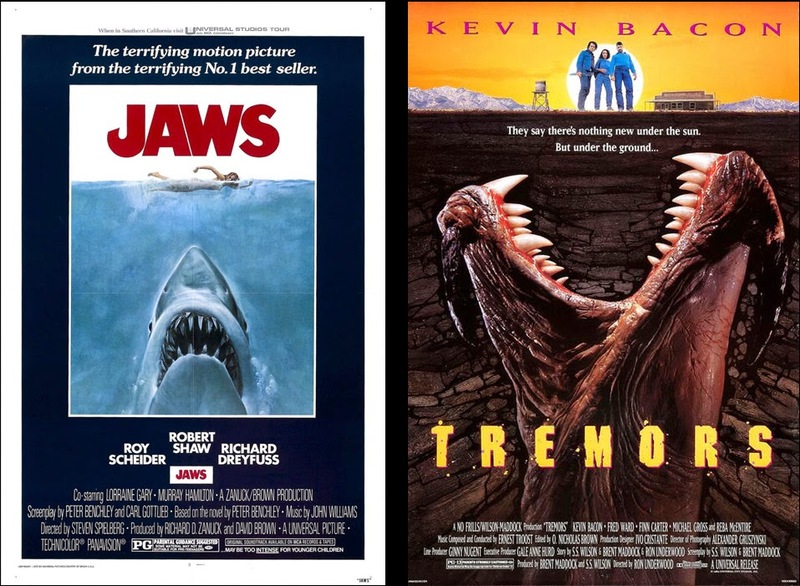 Even the Tremors movie poster is reminiscent of that iconic Jaws poster. And like Spielberg had done with his shark tale, director Ron Underwood cleverly is able to show us where his monsters are without us actually seeing them. Dust kicking up, fence posts being knocked over, floorboards popping up and of course the nonsensical ‘graboid-cam’. Some of it might look hokey, but it was all awfully effective. It was an economical way to stage the scenes and keep the threat alive. It’s a necessity too. It would be kinda tough to show the Graboids actually moving through the dirt. There’s a great gradual setup in the beginning as our characters get established, we get familiar with the landscape and our handyman heroes start to come across some awfully strange things. An old timer on top of an electrical tower who died of thirst, a car buried in the ground, the remnants of an eaten flock of sheep. Seismographs going off the charts. What on earth is happening??? A lot of this stuff looks like it came right out of an old monster movie from the 1950’s. Many of these creepy setups remind me of scenes from Them!, the terrific giant mutated ant movie. There are these unexplainable events that no one can make sense of, until it all becomes clear when the monsters appear. From there on out it’s a lot of running and panic as our characters try to avoid being sucked underground and attempt to make an escape from the ground level town in the valley to the higher mountains. The actors and script by S.S. Wilson and Brent Maddock are a big part of what makes Tremors work and has made it held up so well. One of the keys to making an entertaining monster movie is not only the monster, but the human characters we tag along with and who are struggling to survive. It’s awfully helpful when the monster isn’t around there are characters who can hold our attention and we’re not aching for the monster to just show up so we don’t have to endure much more from them. It’s such a simple rule and yet so many monster movies hope if they pour enough monster destruction onto audiences they will forgive the lack of any likable human characters they can identify with. That recent Godzilla movie may have had a budget over a hundred times bigger than Tremors did and showed monster destruction on a much greater scale, but Tremors easily beats it in any and all things you would want from a monster movie. This might have seemed like a slumming job at the time for Kevin Bacon and something he wasn’t that thrilled to be doing, but the film ended up being better than most of the other projects he was doing at the time and he’s pretty good in this. Same with Fred Ward. They make a surprisingly entertaining duo as they try to out macho each other and trade barbs and jokes. I’ve heard for the longest time Bacon considered Tremors a low point in his professional life, along with having issues in his personal life during this time as well. So it was not something he looked fondly back on. But I’ve read in recent years he rewatched Tremors and was “pleasantly surprised” by it. So it eventually even won over its harshest critic in a way! At the time it was strange to see country singer Reba McEntire showing up in Tremors. This was her first foray into acting and she’s good as the no-nonsense survivalist. Watching her in this I don’t even think about her being that country singer lady. The biggest surprise bit of casting in this and the actor who would become the face of the Tremors franchise is Michael Gross as Burt Gummer. Fresh off the set from Family Ties he must of had a blast playing the gung-ho, gun-loving Gummer. It must have felt like such a great change of pace. The scene of the Gummer’s utilizing every piece of their armory to kill a graboid is so over-the-top excessive you can’t help but laugh. The rest of the townsfolk of Perfection might not get as much screen time, but they serve their roles well. The two real standouts out of the rest of the townsfolk of Perfection is arrogant Melvin (Robert Jayne) who gets a tough ‘the boy who cried wolf’ lesson and grocery store owner Walter Chang (Victor Wong) who seems to be enjoying the existence of these graboids way too much. I love that everyone in the movie is looking for answers from visiting seismologist Rhonda LeBeck (Finn Carter – who I don’t think I’ve seen her in anything else besides Tremors). As we all know with every monster movie the scientist character always has all the answers, knows exactly what’s going and will kindly explain it to us. But here Rhonda is in as much of the dark as everyone else. “You’re a scientist! What do you call these things, where do they come from? Yeah, aren’t you supposed to have a theory or something?” Everyone can’t seem to grasp that no one has ever seen these graboids before and this visiting seismologist has no idea idea what’s going on either. It’s an amusing scene as the group is sitting around debating the origin of these things – are they some kind of nuclear mutation, something the military made, prehistoric monsters, outer space beings? It really doesn’t matter. I still find it hysterical that they’re more annoyed at not getting the answers to this stuff than being shocked or scared by the danger they’re in. “Huh, no name!” Walter angrily says. He seems more concerned coming up with a cool name for these monsters than the danger they’re in and how they’re going to make it out of the town alive. It’s a ridiculous monster premise, but the movie is smarter and more creative than what one would think such a ludicrous story would get. Plus, it has a great sense of humor about itself as well. It knows it’s a silly B-monster movie, it embraces that and it excels at milking as much as it can with it’s goofy idea. Tremors moves at a nice pace in its 90 minute runtime. The special effects hold up decent enough, mainly miniatures and models of the graboids. There’s enough tension and danger to keep things exciting. The graboid attacks are varied enough to not feel repetitive. Then the humor reminds us that everyone knows this is all pretty silly, so just have fun with it. 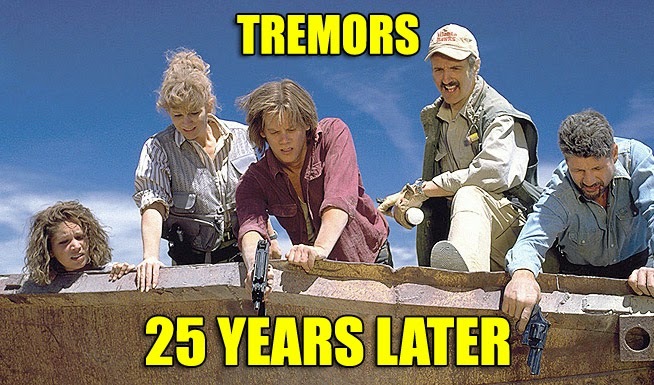 I’m still amazed Tremors has endured for so long. It seemed at the time it would become a perfect little strange B-movie that people might have ignored in cinemas, but they would stumble onto it either renting it on VHS or catching it on cable. It would be a pleasurable Saturday night movie that would catch people off guard, leave them satisfied, but nothing more really. But it ended up being much more and through the years it continued to wrack up a bigger audience than it ever did from movie screens. I never would have predicted it would be the start of this ongoing franchise. 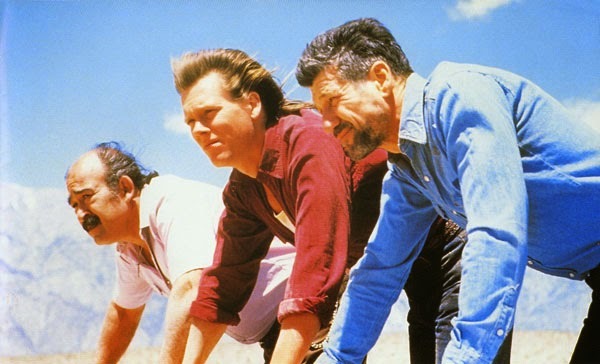 If I was told back in 1990 that one day a making-of history book would be written called Seeking Perfection: The Unofficial Guide to Tremors – I would have thought it was a joke to rub salt into Bacon’s wounded film career. But I think because it was such a well made, entertaining movie that’s what jumpstarted this ongoing saga and has helped it get such a devoted cult of followers. Had Tremors been just a lazy, stupid, straight forward monster movie, I doubt it would be remembered so fondly and we’d be talking about it twenty-five years later. I did watch the sequels and for the most part they were pretty decent. Nothing spectacular, but better than I thought they would be. The graboids would evolve through the course of the movies and it kind of eliminated the underground simplicity of the original. They’re walking and flying and farting out fire. I prefer just big burrowing worms. Plus, I think Gross’ Gummer character works much better as a supporting part and not the lead. 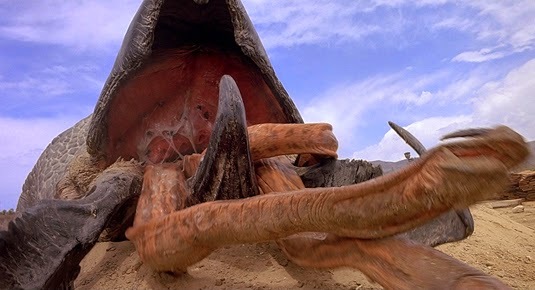 One thing I have never taken to with Tremors is the term ‘graboids’. I know it’s supposed to sound asinine, that it’s the featherbrained marketing genius of Walter who came up with the name, but it always sounded too awkward and never caught on with me. It’s an amusing joke for one scene, but as for the official name of these monsters for the last twenty-five years….eh. 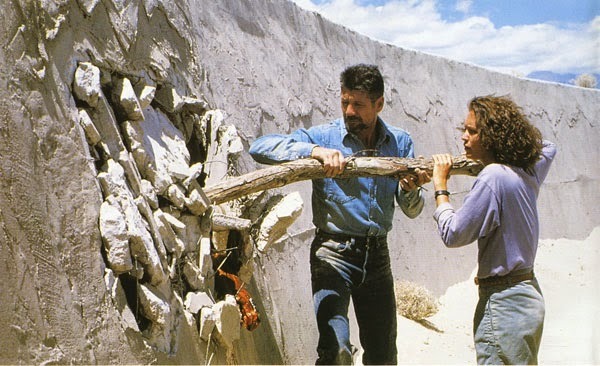 Gene and Roger had somewhat of a disagreement on Tremors during its initial release.